Alice Faye in Lillian Russell (1940). With her mellow singing style and acting ability, Alice Faye rocketed to stardom and became the leading figure in the musical program at 20th Century-Fox during Hollywood's Golden Age. She was a major box-office attration, and became a popular pin-up during World War II. She quit the screen at the height of her career. It seems that young Alice, growing up in New York City of German / Irish parentage, always had the stage in mind. At an early age, she tried out for the chorus of the Earl Carroll Vanities, but was bounced when it was discovered that she was underage. She held on to her star however, and had a big sensational number on Broadway in the George White's Scandals, (along with Ray Bolger, Ethel Merman and Rudy Vallée) in the 1931-1932 season. 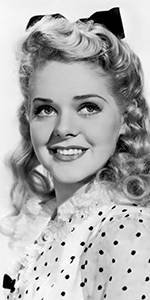 By now, she had changed her name, appearing on Rudy Vallee's The Fleischmann Hour radio program as Alice Faye. George White brought both Vallee and Faye out to Hollywood to make the film George White's Scandals. When the scheduled lead female, Lillian Harvey, stomped off the picture, Faye took over her role; when the picture was released in 1934, Faye became a star overnight. Faye became a protégée of studio head Darryl F. Zanuck, who gave Faye a complete makeover, and shoved her into every big production on the Fox lot. It payed off. Just about all of her films played the Chinese: George White's 1935 Scandals (played in May, 1935), King of Burlesque (played in December, 1935), the Shirley Temple film Poor Little Rich Girl (played in July, 1936 — and where she met future husband Tony Martin), Sing Baby Sing (played in August, 1936), On the Avenue (played in February, 1937), You Can't Have Everything (played in August, 1937), and the monster hit In Old Chicago (played in May, 1938). 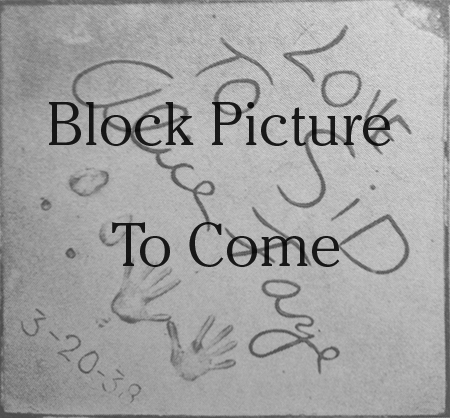 Husband Tony Martin had come along far enough to finally co-star with Alice in a picture which had just played the Chinese in March, 1938 called Sally, Irene and Mary, so Grauman had the duo come and make their imprints together in the Forecourt. Faye followed this with another monster hit: Alexander's Ragtime Band (played in August, 1938). Fox kept her busy: Tail Spin (played in March, 1939), Barricade (played in January, 1940), Little Old New York (played in February, 1940), Lillian Russell (played in May, 1940), Tin Pan Alley (played in November, 1940), That Night in Rio (played in April, 1941), The Great American Broadcast (played in May, 1941), Week-End in Havana (played in October, 1941), Hello, Frisco, Hello (played in March, 1943), The Gang's All Here (played in December, 1943), Four Jills in a Jeep (played in May, 1944), and Fallen Angel (played in December, 1945). Fallen Angel proved to be a turning point for Faye — her part had been drastically cut — she walked off the Fox lot, and her contract. To retaliate, studio head Zanuck had her blacklisted. By this time, Faye had been remarried to musician Phil Harris for four years; she was raising their two daughters and a son from Harris' previous marriage. In 1946, they gathered up their family experiences into a radio program for NBC called The Fitch Bandwagon; by 1948, it was being sponsored by Rexall Drugs. After that, it was called The Phil Harris-Alice Faye Show, where it ran until 1954. Faye returned to the screen in the remake of State Fair (released in March, 1962), and she starred in a Broadway revival of Good News in late 1974, but it was not a success. Faye toured across the country with the show, where it fared better. Harris died in 1995; Alice succumbed to stomach cancer three years later in 1998 at the age of 83. Grauman's Chinese Theatre, Hollywood, California. Tony Martin / Alice Faye Forecourt ceremony, Sunday, March 20, 1938. 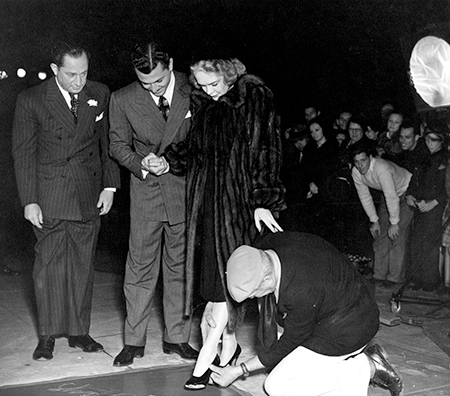 Chinese Theatre manager Harry Marx looks on as Tony Martin assists wife Alice Faye make her footprint with cement artist Jean Klossner insuring a proper impression. Photo courtesy www.alicefaye.com.